CHLI Chairman, The Honorable Lincoln Diaz-Balart, commenced the program by introducing the new Congressional Members of the CHLI Board of Directors, Senators Robert Menendez (NJ) and Rick Scott (FL), and Congressman Darren Soto (FL-09). 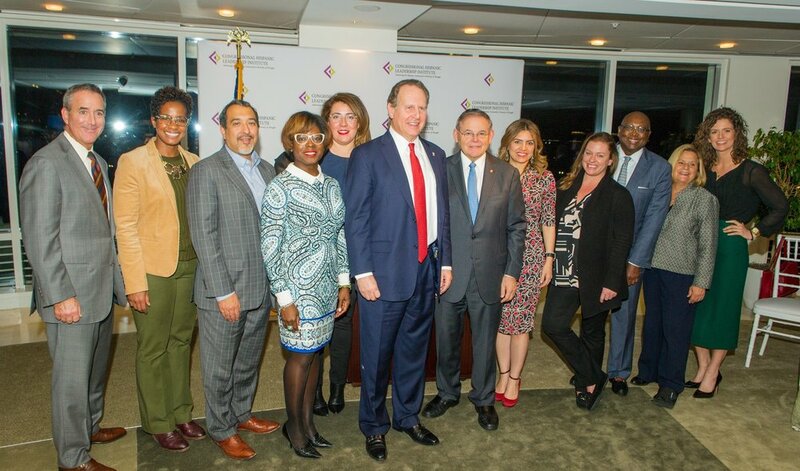 Photo left to right: CHLI President & CEO, Mrs. Gomez Orta; Rep. Flores; Rep. Soto; Rep. Correa; Sen. Scott; CHLI Chairman Lincoln Diaz-Balart; Rep. Adams; Rep. Lee; The Honorable Ileana Ros-Lehtinen; and Rep. Diaz-Balart. 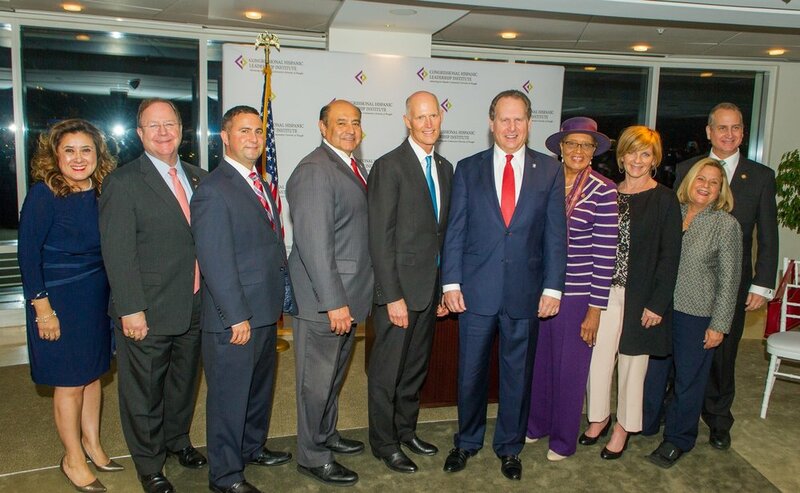 The Chairman also recognized the other Members of Congress who were present, including: CHLI Vice-Chairman Congressman Mario Diaz-Balart (FL-25), CHLI Board Members Congressman Bill Flores (TX-17) and Congressman Will Hurd (TX-23), and guests, Congresswoman Alma Adams (NC12), Congressman Lou Correa (CA-46), Congressman TJ Cox (CA-21), Congresswoman Lizzie Fletcher (TX-07), Congressman Anthony Gonzalez (OH-16), Congresswoman Susie Lee (NV-03), Congressman Ben McAdams (UT-04), and Congresswoman Lori Trahan (MA-03). In attendance as well were His Excellency Ambassador Marios Lysiotis of Cyprus; and His Excellencies Benson Wang and Jerry Yu-Chieh Wang, from the Taipei Economic & Cultural Representative Office (TECRO). “I’m honored to join CHLI’s Board of Directors as we work together to create a better environment for the next generation of Latino leaders. I am committed to fighting for the Hispanic community, to ensure that every child can get a quality education, find a good job, and raise a family in a safe community. CHLI has created opportunities for so many to succeed. I look forward to working with it to expand on those efforts,” stated Senator Scott. CHLI Leadership left to right: CHLI Treasurer, John Hoel, Altria Client Services; Patrice Webb, American Beverage Association; Leo Muñoz, Comcast /NBC Universal /Telemundo; LaKeitha Anderson, RAI Services Company; Angela Arboleda, Herbalife Nutrition; CHLI Chairman The Honorable Lincoln Diaz-Balart; Senator Menendez; Susan Santana, AT&T; Sara Decker, Walmart; Rodney Hood, JPMorgan Chase & Co.; The Honorable Ileana Ros-Lehtinen; and Christina Carrica Haley, Akin Gump. The CHLI Board of Directors would like to congratulate and welcome all Members of the 116th Congress and offer a special thank you to John Hoel, CHLI Treasurer with Altria Client Services for hosting the reception. Thank you to CHLI Advisory Council members, Christina Haley with Akin Gump and Marie Sylla-Dixon with T-Mobile for sponsoring the event.